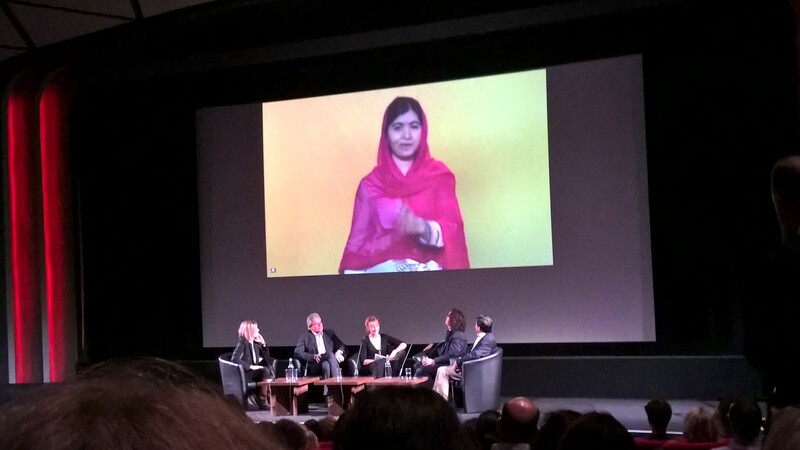 On 8 October ‘He Named Me Malala’ premiered at the British Film Institute (BFI), London. This documentary film tells the story of Malala Yousafzai whose story has gripped the world. 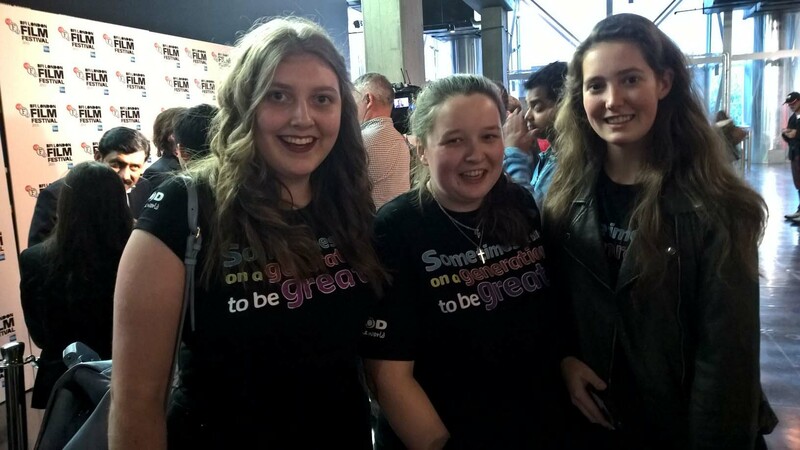 Three of our young leaders, Ladi, Flo and Katherine, had the opportunity to go along to this event and here they reflect on this experience. On October 9th, 2012, the Taliban shot Malala in the head on her way home from school. This assassination attempt sparked international condemnation for the Taliban, but also mass support for Yousafzai and her campaign of ‘equal education’. I’ll be honest, before watching this documentary I had spent little time researching Malala Yousafzai, and really knew little of her. I didn’t realise that in fact she began to campaign when she was 11-12 by writing a blog under a pseudonym for the BBC, which detailed her life under Taliban occupation. The following summer, Adam B. Ellick (a journalist) made a New York Times documentary about her life in Swat Valley in Pakistan. As a result, her prominence grew and grew, and if anything the Taliban’s reaction has only furthered her campaign efforts and made her story even more renowned. Yousafzai began defying the social structure at her own accord, and for this I truly admire her. With International Day of the Girl day falling last Sunday (the 11th October), it was a perfect time to see this documentary, which reinforced the importance of equality throughout the world, and especially in education. Her famous slogan “One child, one teacher, one book, one pen can change the world”, really does ring true. The thing that struck me most during the documentary and Q and A session afterward was her humbleness. After every question (over a Skype Video feed) she would say ‘well, first of all, thank you so much for your question’. In every answer she would reinforce that fact that she represented thousands of people everywhere, and not just herself. Not only this, but she and her family had the most wonderful sense of humour, which was very prominent in the documentary and in the Q and A session. In the Documentary Malala explains how hard life became when the Taliban took over her home town of Mingora, in the Swat District of north-west Pakistan. Malala believes “there is a moment where you have to choose whether to be silent or to stand up” for me this quote is inspirational because she shows that we are the great generation and no matter what age with determination you can make anything happen. 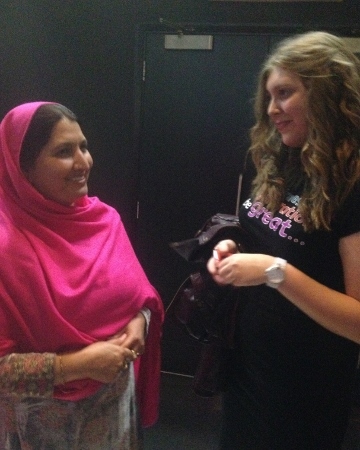 Malala’s mother and Katherine, one of our CAFOD young leaders. The Highlight of the premiere for me was meeting Malala’s parents and getting a hug from her mum, because it is from them that she got her determination to be educated. Malala grew up in the school that her dad set up and from an early age learnt the importance of education, It was because of Malala’s dedication to her studies she decided to not go to the premiere but instead took part in a question and answer session over skype. In the question and answer session Malala thanked teacher’s for their dedication to education and urged them to talk in their schools about how education can change people’s lives. Malala’s personality shone through in both the film and the question and answer session showing that she is a normal 18 year old girl who is incredibly funny and charismatic. The film and following Q&A session (with the directors, Malala’s father and Malala on skype) showed us the true power this young girl has on society. Despite being forbidden to attend school under the Taliban regime Malala and her father spoke out for the right for girl’s education. Being only 16 she won the noble peace prize in 2014 when the average age was 62! I found the film portrayed what a hugely influential figure her father was in her life. This was seen from the moment she was born when he looked at her admiringly and named her after the courageous Pashtun hero, Malalai,. He also wrote her name on the family tree which had never had a women’s name on it until that point. Being a teacher himself he encouraged her and inspired her to speak out for injustice. Her film doesn’t only tell her own personal story but the story of millions of other girls. The film touching and powerful and I felt successfully raised awareness to the current situation of girls receiving education. Equality between men and women is a key tool in eradicating global poverty. Find out about CAFOD’s work on tackling gender inequality.